January 3, 2017 By Joe H.
12 with modules: me, Ed, Dave, George, Tim, Fred, <moderator>, Bob B, Bill K., Dr.
up and running when the museum opened at 10AM. We had no problems, and the green light was lit.? with the AIU, but it should probably be inspected by MTH. Eve at 4PM and were on the road at 5:05. Unbelievable. kids of all ages, the visitors put $126.55 in the collection boxes. all the work well worth it for me. 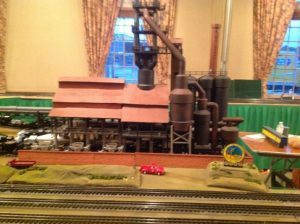 December 22, 2016 By Joe H.
Once again the Winter Wonderland show at the Manassas Candy Factory proved a success in spite of the weather. Above average crowds were evident Wednesday through Friday but the Ice storm Saturday impacted attendance. The ice around the Candy Factory building was very treacherous. Several Trackers slipped and fell but survived without serious injury. Attendance for this year totaled 1950 per the Candy Factory staff. Everyone who enters the building is counted by the security guard. 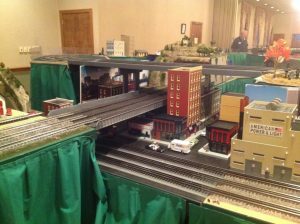 O Gauge Layout: The crossover module was included in this year’s 28 X 38 foot design and was configured as a three loop operation. The inner loop was a figure eight while the middle and outer loops traversed the perimeter of the entire layout. The layout height this year was the normal 40 inch, no grades. The configuration provided plenty of inside access for spectators and an interesting layout for trackers. The crossover proved hazardous with several near misses and two “T” bone incidents. No names will be mentioned. Scenery was exceptional again this year and generated a lot of interest. Monuments, winter scenes, city scenes and multiple mountains graced our modules. With 8 corners there were plenty of curves. Steve’s 44 car Norfolk & Western coal train was spectacular as it navigated every corner without incident. Standard Gauge Layout: Many thanks to Ed Beaver for providing track and assistance with the setup. Ed’s special effort was appreciated. 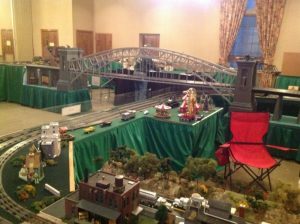 Clem and Ed put together an 8 x 22 foot tabletop layout that featured a Hell Gate Bridge, mountains and two loops of track. Operational assistance was provided by Norm Beaver (Ed’s brother), Harold and Dave Eadie… Clem ran his one of a kind Norfolk Western “J” engine and passenger car set all Standard gauge of course. Clem also had a unique patina (rust) train that was a survivor of a major disaster, fascinating! Food: As usual the quality and amount of food was over the top. Spaghetti and meat sauce, Chili and fixings, Chicken soup, Sandwiches and Swedish meat balls. Of course deserts were plentiful, cake, pie, cookies, brownies and more. Thank goodness no calories are counted during tracker train shows. Thanks to all contributors, their efforts are appreciated. Special Events: We opened early Wednesday, actually at 1 PM for a special private showing for a Prince William County Special Needs school group. The teacher showed up with 24 kids (K-4) and just as many parents, Plenty of Trackers were on hand to run trains to everyone’s delight. A Christmas train with multiple new gondola cars full of goodies provided candies for all. (We did check with the teacher before-hand). Observations: Plenty of track time was available with the three fairly long loops. Everyone made an effort to keep the tracks full. Most of the time 4-5 trains were in motion. Traversing the outer loop at (MTH) 35 mph took 2 minutes 40 seconds. The new cart for the VA four foot corners is very cumbersome to use. The thumb screws are difficult to reach both removing and inserting. The idea of a cart or carts for these corners is an excellent idea but needs to be refined. We could have carried the corners up and down (3rd floor to lobby) several times compared to the amount of time it took to mount the corners on the cart. Food and money donations for “SERVE” seemed to be about the same as past years. I don’t have their report at this time. We did not use our Red donation boxes because boxes were already in place for the SERVE donations. Summary: Another successful show. Spectators were very appreciative and all Trackers enjoyed themselves and the layout preformed as expected. No major problems were encountered. As usual it took about two hours to take down the layout (Elevator) and depart the Candy Factory. Many thanks for all the members who supported the show. The effort was over the top! 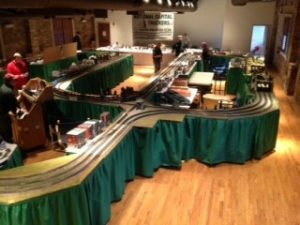 November 29, 2016 By Joe H.
November 28, 2016 By Joe H.
The Team of Ralph Fox, Bill Hakkarinen, Ron Tucker set up the layout on Thursday 17 November 2016 and ran trains on Friday 18 November. We used 21 Modules plus the Geezer Gate from the Md trailer. We used the four foot corners and had the entire layout set for a 31.5” rail height. We decorated with a variety of toys and buildings with winter and Christmas featured on most of the modules. 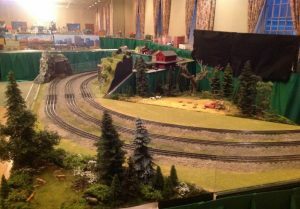 We set up the layout and most of the scenery Thursday night between 6 and 9 PM. We completed the scenery for the layout early Friday morning and started running trains by 0800. The first class of students arrived at 0915. The audience included children from the ages of 3 thru 8 plus teachers and school staff. Between 0915 and 1400 approximately 900 students visited the layout. The purpose of the Trackers doing these shows at Eagle Academy is to talk about how trains are an important part of transportation in the US and everywhere else. 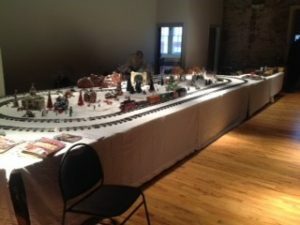 After each class had a chance to look at the layout, they were moved up on the stage at the end of the room and one of the Team talked to them about types of trains. The Eagle Academy staff attended the show and was very pleased with how the show went. Check the website for photos or this Youtube link for a video of the show. The track plan was a rectangle 28’ x 32’. We used the Md Trailer for the Geezer Gate, Power Cabinet and Corners. November 19, 2016 By Joe H.
The Eagle Academy Public Charter School Capital Waterfront Campus is the smaller of the two Eagle Academy campuses. 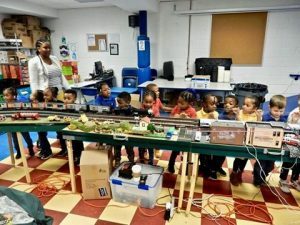 The Eagle Academy Capital Waterfront campus had 124 students (pre-K thru 3rd grade) who attended the train show as part of their program on Transportation. The Tracker Team arrived on site at 1200 and promptly retired to an eatery across the street. We began the setup at 1300 after the students had finished their lunch in the cafeteria. We had trains running at 1545 and had everything completed by 1645. We used an 8 module square with the wide radius curves giving an overall layout of 20’ x 20’ with a rail height of 31 ½”. We encountered no issues getting to the facility or setting up. We were provided with parking which had easy access to the room. Numerous children looked into the room as we were setting up. They were clearly looking forward to the next day’s show. A number of them commented to friends that they remembered us from our show in February 2016. Since there were only two of us doing the show, Bill ran on one loop with two trains running. He ran one train on each of the other loops which gave us plenty of run time. We began running trains at 0800 to ensure we were ready and then the students began coming into the room at 0900. One class arrived every 20 minutes. We ran essentially nonstop from 0900 until 1200. By that time all of the students (124) had been able to attend the show. The classes were scheduled so that the younger students came in first and the 3rd graders were the last classes we entertained. We stopped the trains after about 15 minutes with the 2nd and 3rd graders and talked about the types of trains that used to run and still run now. We discussed Steam, Diesel and Electric power and the types of trains (freight and passenger). We had examples of each train and car on the tracks to show the students. Bill had a manual switch to show the students how trains moved from one track to another. We also talked about being safe near railroads and the need to stay off the tracks, that a train can come up very silently and hurt you. The students and staff enjoyed that part as much as watching the trains and looking at the decorations. We were completely out of the building and on our way home at 1420. It was another very successful National Capital Trackers show. One of the younger classes. October 29, 2016 By Joe H.
The York show always presents additional challenges beyond our typical local venues. The distance involved the commitment for 4-5 days, and the scrutiny of our peers for starters. 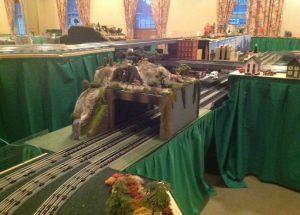 Last December when Jack asked me to be Trackmaster for the event I welcomed the challenge but was also very much aware of the difficulty of the task ahead. Design: The first question was which hall at York? The White and Black halls were both considered, but TCA opted to give us a smaller space in the White hall so the Black hall was our choice. Since we had already successfully displayed two levels at York the thought was why not three levels, could it be accomplished? After dozens of sketches and input from Steve, Justin and Bill and Bear discussing the feasibility of the design, we finally decided on a track plan featuring the Triple Crossing (Richmond), the Hell Gate Bridge, the X crossing and the 6 track yard all incorporated into a 28 X117 foot layout. The designed layout was very complex to say the least. The Richmond required both a 40 inch to 31 inch grade and a 40 inch to 48 inch grade while the grade that went under the Hell Gate Bridge was 40 to 31 inches. To keep it in perspective the date was Feb 2016. Construction: Several new modules were needed. .Four foot corners, 45 degree corners, 6 track modules for the yard and the actual Triple crossing module were all new construction for the show. Justin, Steve and Matthew designed and built the 4 foot corners, the 45 degree corners and Triple crossing aka Richmond with Justin adding 6 modules for the 6 track yard. Bill and Bear added two additional 6 track modules for the yard. Scenery: The scenery for the show needed to be exceptional and it did not disappoint. Bernie held scenery work-shops and assisted with the design and actual construction. Every module was innovative and attracted the attention of everyone. A tour around the layout was a feast for the eyes. 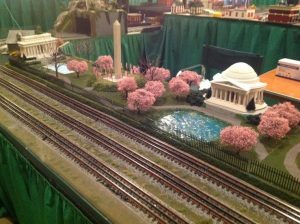 Jack’s Washington DC monuments with Cherry Blossom trees, (You could smell the blossoms. ), Bear’s beautiful mountain, Richmond led the way as you entered the hall. A spectacular downtown scene, Bill H’s city scene, Craig’s train stations, Bill R’s mountain scene, Jim’s Halloween theme, Matthew’s engine yard theme, Steve’s (9) diamond crossing with an outstanding industrial scene plus the time saver, The Pittsburgh Steel Mill, John M’s Oil Distribution theme, Bill. 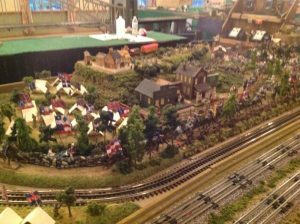 C incredibly detailed mountain, Bernie’s Civil War scenes (smell the gunpowder), Bob E’s American Heritage, Ed’s industrial scene , Allan’s detailed rural scene, Chuck’s Circus, Joe’s new town and detailed buildings, Rich’s Old Faithful, Bill K’s industrial scene, and Justin’s Yard. Scenic Express provided two fully decorated additions to our new 4 foot corners. Absolutely beautiful! An outstanding example of their products used to perfection. Special thanks to Justin and Steve for coordinating this effort with Scenic Express. The total setup time required 8+ hours on Tuesday to get the critical pieces in place for the Wednesday general setup, and 14+ hours of work on Wednesday totaling about 22 hours. To complicate matters the bathroom wall moved on us and required some on site redesign to make things fit. We used every special make up piece planned for plus a few extras. 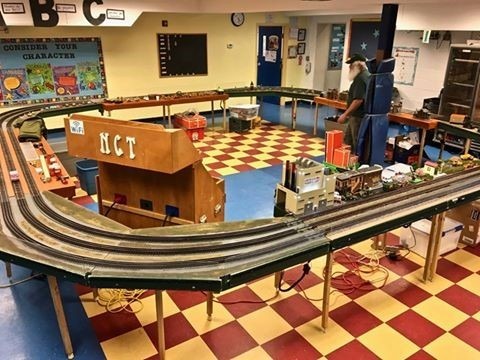 At 3:30 on Wednesday afternoon the entire layout was connected and in place ready for track checks followed by skirting and scenery. .Not any additional pressure, we learned Monday that Fox News would be on site at the Black Hall at 8 AM Thursday morning for live TV coverage. In the end they did not show due to covering a College Teachers strike in the Harrisburg/York/Lancaster area, but we were ready for them! Technical Issues: To say we pushed the envelope goes without saying but I believe we ripped it apart! We also discovered you can only use one TMCC base or conflicts occur. The Base in the Richmond side powerhouse was used. Trackers had to be aware of their distance from the base when operating trains. The HGB presented some ground interference issues that were mitigated by moving the ground wire from underneath the bridge to a long-side the track on top. Since the longest loop that traversed the entire layout ended up close to 400 feet of track we exceeded the DCS channel output. To resolve the issue the track was isolated at the X crossover into two sections. The section on the Richmond side was powered through the TIU in the VA cabinet and the HGB side was powered though the MD cabinet TIU using a 18V power brick for power. This configuration proved very successful. DCS engines experienced start- up problems in the 6 track yard. As a temporary workaround we used mainly Legacy and TMCC engines although DCS operations were successful in some instances. After troubleshooting, some success was achieved but not 100%. Steve spoke with the MTH people in the Orange hall and they (MTH) graciously sent their DCS engineer (Jason) to the Black hall to give us a hand resolving the problem. The suggestions offered by the Jason proved on target. Steve and Justin reconfigured the 6 track yard wiring configuration and improved the DCS operation by a 100%. A simple explanation was isolating the yard with its own power and TIU. Kudos to both Steve and Justin for their tremendous help on all the technical issues encountered. Logistics: coordinated delivering both trailers on schedule. Besides hauling numerous modules in his own van he also was responsible for all the refreshments and keeping them supplied throughout the show all while providing yeoman work and direction during the install and takedown. Steve and Justin actually rented their own U-Haul truck to transport all the modules that were specially constructed for the show. John Z’s Hell Gate Bridge also found its way on to the truck. Clem was welcomed sight on Wednesday morning toting 4 dozen “Maple Donuts” for everyone’s enjoyment. They all disappeared before the show ended. Thanks Clem. Not to be outdone Justin and also added to the sweet delight. We were in donut heaven! Operations: Justin’s 6 track yard functioned perfectly with switch motors controlled via an IPAD using a WIFI connection. The Yardmaster function was filled by John Masiyowski, Bill Creech, Bear Bailey, Rich Colton, Jim McDermott and George Tsakiris. Hats off to these guys for a smoothly running operation. Track cleaning was a must chore to keep trains running at peak performance. Our President, our VP, and just about every tracker pitched in and helped out, including yours truly very early every morning. As expected keeping the tracks filled with running trains was a challenge. The plus side was the member timeliness while adhering to the runtime schedule and removing trains once run times were completed. John also provided some interesting facts about our operations. Take-Down: At 1:30 on Saturday a meeting was held to review the take down sequence. At 2 PM trains were shut down and the process began, at exactly 5 PM. Justin and Steve’s U Haul truck was locked and ready to roll, the last one loaded… Unbelievable considering a 28 X 117 foot fully operational layout was functioning perfectly a mere 3 hours ago. 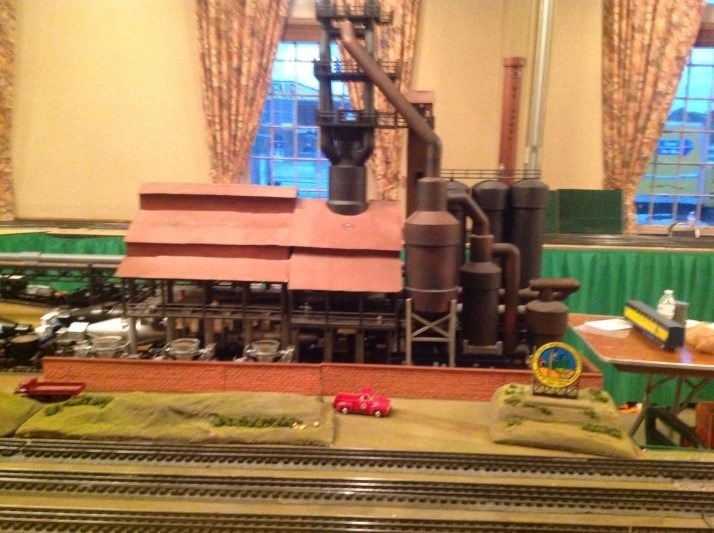 Summary: I can’t thank everyone enough for the tremendous support in building and operating the York Layout. The layout was very ambitious and required many hours of planning and construction to be a success. Everyone doing their part made the show an overwhelming success. Special recognition and thanks are extended to both Justin and Steve. Without them this show would still be a dream on a piece of graph paper.